A group of five young male Hawaiian Crows or ‘Alalā, a bird species that has been extinct in the wild since 2002, were released into the protected Pu‘u Maka‘ala Natural Area Reserve on 14 December 2016. The Pu‘u Maka‘ala Natural Area Reserve on Hawai‘i island is an area that conservationists have worked to preserve, protecting native plants and species, and it represents the type of habitat where Hawaiian Crows originally lived. A moment of high importance for endangered species and Hawaiian conservation. 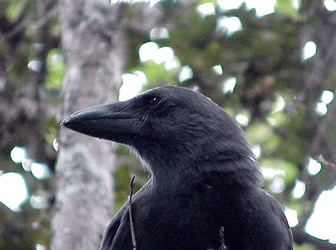 The Hawaiian Crow has been preserved in captivity, with now more than 100 individuals, at the Keauhou and Maui Bird Conservation Centers managed by San Diego Zoo Global. In mid-October 2016, the five young Hawaiian Crows were moved to a flight aviary to allow them to acclimate to the sights and sounds of the Hawaiian forest, in preparation for their release. One week prior to the release, they were then transferred to a smaller aviary in the forest at Pu‘u Maka‘ala Natural Area Reserve, from which they were directly released. After the release, the Hawaiian Crows had been observed doing well and eating from feeders placed in the area. However, at the end of December three birds were found dead. The confirmed cause of the deaths is currently unknown but conservationists from the Hawai‘i Endangered Bird Conservation Program hope to gather information about what happened to the birds through necropsy examinations. 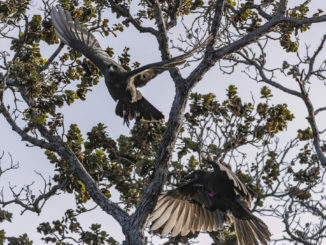 The two surviving Hawaiian Crows were moved back into the aviary at the Pu‘u Maka‘ala Natural Area Reserve to ensure their safety while the conservationists await the results of the necropsies. Some level of mortality is to be expected when reintroducing a species back into the wild. The conservationists hope they can learn from this setback, respond and continue to strive for the long-term success of the Hawaiian Crow. No one knows how the loss of this small frog will affect us or the earth. We must support the planet’s health, clean soil, air, water and preserving the plants and specialized species which provide necessary balance.